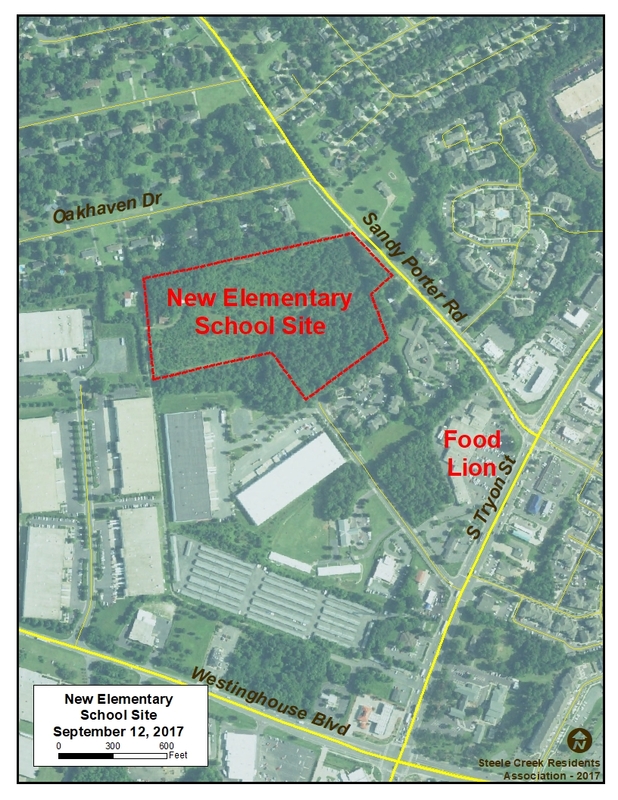 (September 12, 2017) The Charlotte-Mecklenburg Board of Education plans to approve the purchase of approximately 19.75 acres in five parcels on Sandy Porter Road south of Oakhaven Drive and near the Food Lion shopping center at its meeting this evening. (See Board Meeting Agenda Item.) The property will be used to develop an elementary school to relieve Nations Ford, Steele Creek, and Sterling Elementary Schools. The total purchase price is $1,600,000 to be paid to three different owners. The property is comparable in size to the 18.08 acre site of River Gate Elementary School. Developers previously had proposed apartments or townhouses on this property but had met opposition from neighbors. Mecklenburg County voters will see a $922 million School Bond issue on the November 7 ballot. This includes $29.2 to build this new elementary school in Steele Creek (as well as $110 for a new relief high school for Olympic and $10.1 million for Phase One of Career and Technical Education upgrades at Olympic and three other schools). Charlotte is planning to upgrade Sandy Porter Road through the Comprehensive Neighborhood Improvement Program. That project requires action to accommodate storm water runoff, and planners hope to include a facility that will provide storm water retention for the road widening as well as the new school at the school site.